“Radio Unnameable” host Bob Fass with a group of in-studio guests. Courtesy of Lost Footage Films. Columbia University will preserve and provide access to almost two decades’ worth of audiotapes from the archive of groundbreaking broadcaster Bob Fass. Through a grant from the Council on Library and Information Resources, the RBML and Columbia’s Preservation and Digital Conversion Division will preserve Fass’ broadcasts from the 1960s and ’70s. A pioneer of “free form” radio for seven decades, Fass is best known for his late-night program Radio Unnameable. 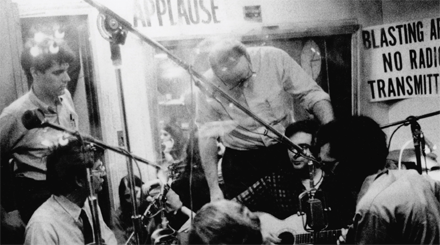 During the sixties it featured unscripted appearances by poets and musicians like Allen Ginsberg and Bob Dylan, and social activists like Abbie Hoffman and Timothy Leary – a forum where listeners could interact with their idols and one another. In 1968 alone, Fass broadcast live events like the “Yip In” at Grand Central Station, Columbia University student protests, and the Chicago Democratic National convention. Once digitized, these recordings will be a major resource to study mobilization of dissent via mass-media in late-twentieth century America. And happy birthday, Mr. Fass! Today (June 29th) is his 85th birthday. This entry was posted in American History Collections on June 29, 2018 by Columbia Rare Book & Manuscript Library.